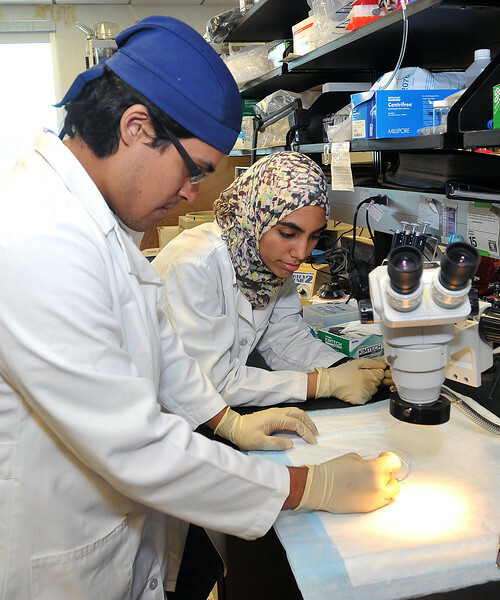 Emmanuel “Manny” Rosas, left, and Hajer Mazagri are working this summer as biomedical research interns in the lab of Dr. Richard Egleton at Marshall University. Their internships were made possible through the university’s Summer Research Internship for Minority Students (SRIMS) program and the West Virginia IDeA Network of Biomedical Research Excellence. Rosas attends the University of Texas at Brownsville. Mazagri is enrolled at the University of Charleston. Photo by Rick Haye/Marshall University.